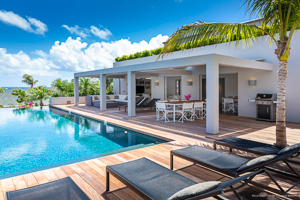 Villa UJV 251, also known as Eden House, ia a three bedroom villa located in Marigot, St Barts, is a modern waterside villa designed by a European architect. The villa has a minimalist style with clean-cut lines and angles. The villa uses natural materials and top-quality finishes including bleached teak woodwork, lava stone, and Balinese pebble floors, accented with beautiful modern Italian furniture. Rooms are painted dove gray, each with a different vibrant color accent drawn from nature's most incredible hues. In the main living area, the principal color complementing the gray is a rich Hermes orange. This dramatic theme continues with large white sofas and a dazzling tangerine orange coffee table, and contemporary Italian lighting with steel down lights. The living area is fully technologically-equipped. The kitchen is a gourmet cook's delight, with top-of-the-line equipment, including 2 stainless-steel fridges and 2 Miele dishwashers. Dine in comfort at the Italian-designer table inside, or at a matching one on the shaded terrace outside. The three bedrooms all share the same design concept, each with its own color scheme: rich bougainvillea pink accenting the dove gray bedroom located off the main living area, and the 2 bedrooms above, one with translucent ocean turquoise accents, the other with banana-leaf green. The ensuite bathrooms have Balinese pebble-inlaid showers, with both overhead stainless steel showerheads and hand-held showers and double sinks. Villa UJV 251 is supplied with luxurious European bath products from the Serena Linley Company, which are made in Provence with fragrances developed in Grasse, France. The gray infinity pool, surrounded by a huge deck area, overlooks the sea. A solitary Alexander palm, and designer white and gray chaise loungers complement the decor. The large swimming pool, great for laps, has programmable lighting that provides an ever-changing light show at night or the simple tranquility of a particular color. A path leads down through the tropical gardens to the property's own private bayside coconut grove with fine white sand, from where access to the sea can be gained via some rocky steps. The bay is part of the island's marine nature reserve and is home to turtles and a variety of tropical fish, and is fantastic for snorkeling. NOTE: Thanksgiving rentals are at the 3-bedroom rate only.